Nearly 200 people made their way to the Billy Wilder Theater at the Hammer Museum in Westwood last Sunday, March 13, to see three separate and truly emotional episodes of Ralph Edwards “This Is Your Life”. These most memorable episodes each featured Holocaust survivors, with different and compelling stories. These three individuals, Ilse Stanley, Sara Veffer, and Hanna Bloch Kohner, were surprised by host Ralph Edwards during his introductory remarks as he walked down the aisles of his studio audience. My mother, Hanna Bloch Kohner, was the first Holocaust survivor, in 1953, to have her story told on national television. I would like to thank the UCLA Film and Television Archive for the opportunity to speak to a truly receptive audience about my mother’s experience, growing up as a child of a Holocaust survivor, and our non-profit charity, “Voices of the Generations”, founded to inform people across the country, utilizing “This Is Your Life, Hanna Bloch Kohner”, as a personal and unique approach to Holocaust education. – Julie. LA Times – In Case You Missed It! In case you missed this great review by Kenneth Turan of the Los Angeles Times on March 3. 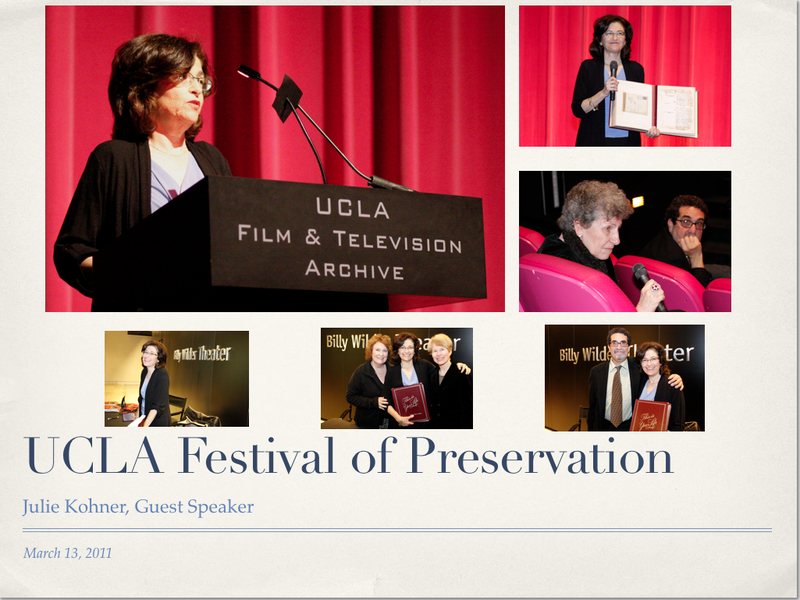 Here is the link: LA Times review of UCLA Festival of Preservation. Public Radio International’s “This American Life” March 4-6 will feature an episode from Allison Silverman discussing stories about the perils of giving and receiving gifts including what happens when – surprise! – your whole life past gets laid out for a live TV audience. This story will include excerpts of “This Is Your Life”. Julie Kohner and Allison Silverman spoke at length regarding the feelings Hanna Kohner had about being a surprise guest on “This Is Your Life”. To listen to the archived audio of this broadcast from March 4, 2011, click here.